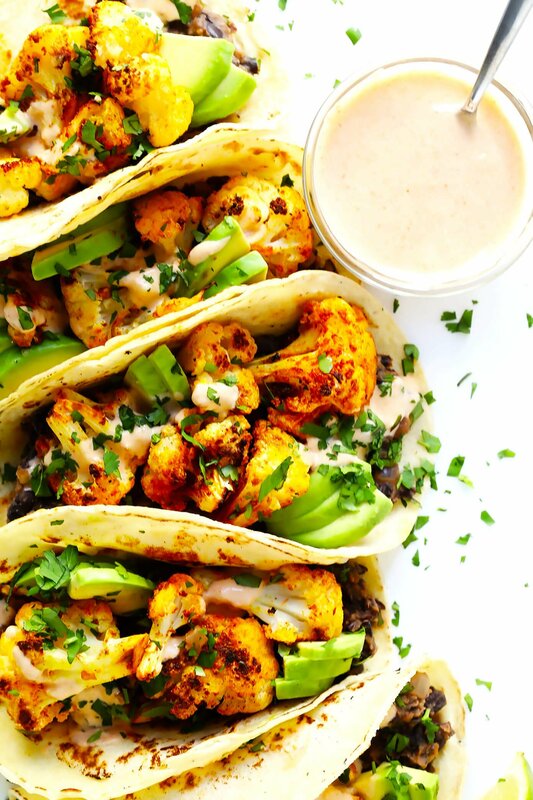 These Roasted Cauliflower and Black Bean Tacos are topped with a zesty tahini-cumin-lime crema, they’re naturally gluten-free and vegan, and muy delicioso. One of the random questions I love asking our expat friends here in Barcelona is where they go when they’re craving some comfort food from home. Everyone’s eyes always light up when you ask — because, as we’ve learned — everyone has those days when all you want is a bite of something nostalgic that tastes like home. And sure enough, everyone has their go-to spot. Our Irish friend immediately told us where the perfect pub is located in Barcelona to grab a pint and some stew. Our Romanian friend whipped our her phone to show us which restaurant is legit authentic in town. Our Swiss friend brought some of her favorite chocolates over to share with us. Our German friend told us where to we need to go for our next dinner date. And hey, as you might have caught in our (new!) January monthly update video, our local friends here also don’t want us to miss any of their favorite comfort food traditions, and baked us our very own king cake for Epiphany, and invited us along to experience our very first calçotada this month, just so we didn’t miss a thing. As you might remember, our first date was a 7-hour chips and salsa-a-thon…eventually followed by a surprise proposal party at the same Mexi restaurant…followed by a wedding full of tacos…followed by a honeymoon in Oaxaca…and a zillion chips and salsa happy hours in between. So it probably should come as no surprise that when we’re feeling all those feels and craving some comfort food from home, we tend to reach for tacos over burgers any day. Thankfully, we’ve finally found a killer Mexican restaurant here in Barcelona, when we feel like going out for some authentic food. But most of the time, we opt for taco nights in, with homemade salsa and margaritas and comfy pants. Do you know Sonja and Alex from their vegetarian food blog, A Couple Cooks? Somehow, I still have never crossed paths with these two kindred spirits in person yet. (Although I think we’re finally going to remedy that with their upcoming trip to Spain, yay!) But we have been internet buddies and I have been following their blog for years. And amongst the many things I love and admire about these two, I especially appreciate how beautifully and honestly they have written about their story, I love thumbing back through the archives of their Healthy and Whole series for inspiration in the kitchen, I tune in regularly for their podcast (and love their focus on the stories and people behind the food), plus I’ve gotta say, their cute little son, Larson, always makes Instagram a brighter place. I’ve also always appreciated their thoughtful approach to creating delicious and simple vegetarian recipes for years, which they regularly share on their blog. So the release of their very first cookbook is an exciting one! It’s aptly named Pretty Simple Cooking. And in addition to 100 recipes (with photos for each), this book is filled with beautiful original watercolors, lovely “life lessons” essays at the beginning of each chapter, and tons of helpful tips and inspiration to make cooking all the more delicious and enjoyable. I totally recommend checking it out. When Barclay and I were thumbing through the book, trying to decide which recipe to make, these tacos jumped out at us on a cold and rainy day when we were craving some comfort food. And sure enough, they totally hit the spot. The base of the recipe is a huge pan of roasted cauliflower, tossed with turmeric and other zesty spices, which Barclay and I could have easily just enjoyed as a meal on its own. But when paired with refried black beans and their cumin-lime crema (which is actually vegan, made with tahini), and lots of fresh avocado, lime juice, cilantro and pepitas…these tacos came together to be a totally hearty and totally delicious meal. A great recipe, created by two great people. 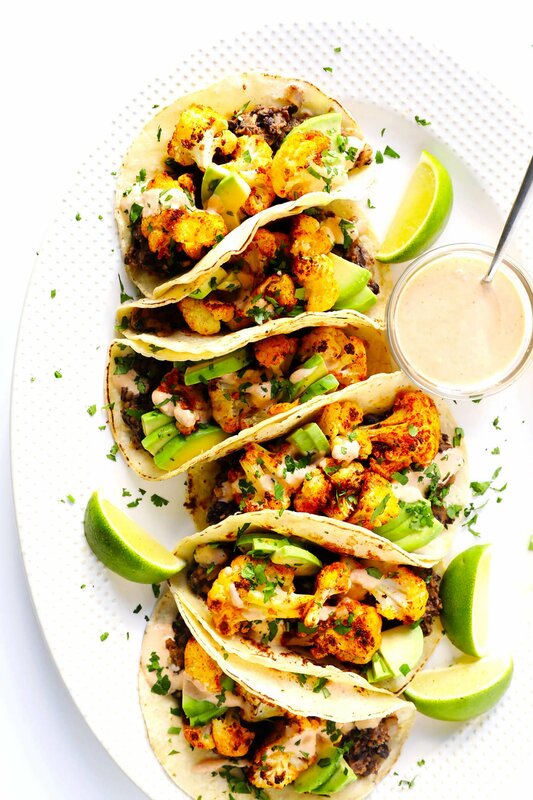 Be sure to check out their cookbook, and enjoy these tacos! Prepare the cauliflower, refried black beans and crema as directed below. 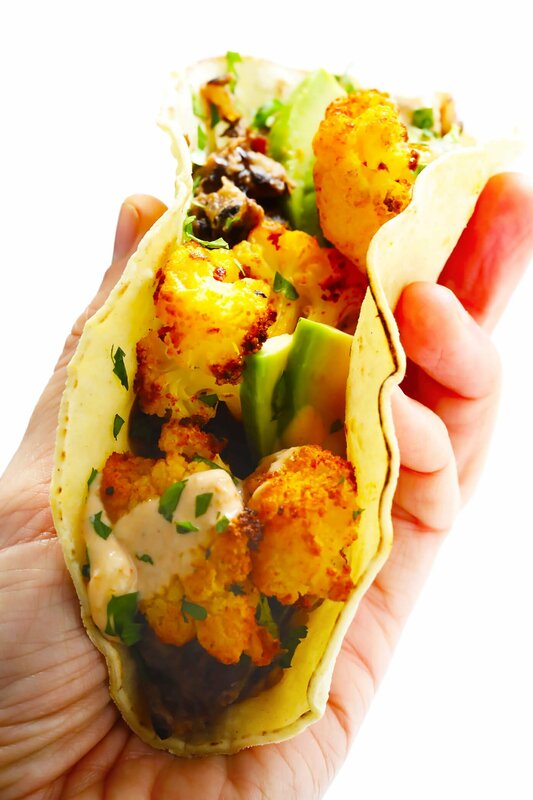 To serve, place a layer of refried black beans in a tortilla, top with roasted cauliflower, a drizzle of the crema, and your desired toppings. In a large bowl, mix the cauliflower, garlic, olive oil, cumin, salt, paprika, crushed red pepper flakes, black pepper and ground turmeric until evenly combined. 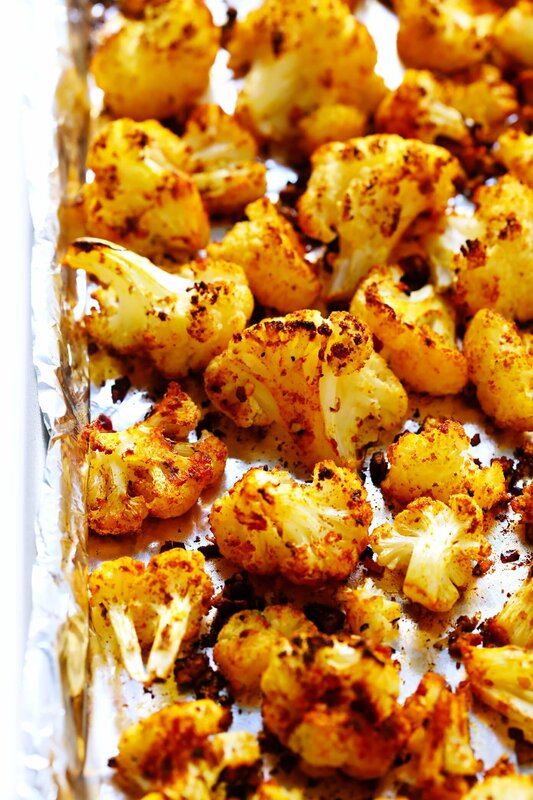 Line a baking sheet with parchment paper or a silicone mat, then place the cauliflower in a single layer on the sheet. Roast for 25-30 minutes until it is tender and browned, stirring once halfway through. Peel and halve the onion, then slice into half-moon shapes. Drain the beans, reserving 1/2 cup of the can liquid. In a medium saucepan, heat the olive oil over medium heat. Add the onion and sauté until translucent, about 3-4 minutes. Add the beans, reserved can liquid, kosher salt, chili powder and black pepper. Turn the heat to medium low and cook for 10-15 minutes, stirring often and smashing the beans toward the end of the cook time, until most of the liquid has cooked out and the texture is mashed and thick. Scrape the bottom and sides of the pan as necessary. Taste and season with additional salt as desired. In a small bowl, stir together the garlic, lime juice, tahini, olive oil, hot sauce, cumin and salt until evenly combined. Add 1-2 tablespoons water if necessary to achieve a creamy consistency. *If you’d like to char the tortillas, turn on a gas burner to medium heat and place the tortilla directly on the grate. After about 15 seconds, once the edges are lightly charred, use tongs to flip the tortilla. Then heat on the opposite side until lightly charred. Repeat for all tortillas, keeping a close eye on them while cooking so that they do not catch fire. Recipe slightly adapted from A Couple Cooks | Pretty Simple Cooking: 100 Delicious Vegetarian Recipes to Make You Fall in Love with Real Food by Sonja Overhiser and Alex Overhiser. Awesome, I’ve been looking for more vegetarian taco recipes lately! Look forward to trying this one. I’m in Barcelona this week. Can you please tell me the name of your favorite Mexican food restaurant? We are from Texas and have been traveling for a few weeks so we are craving some good Mexican food. I already have Mendizabal on our list of places to try. Thank you! Ali, thank you SO MUCH for featuring Pretty Simple Cooking and being overall incredible! We truly appreciate you listening along on the podcast and following our story with Larson. (He says hi, BTW!) Here’s to a meet up in Barcelona and I’m so, so looking forward to an in-person visit. (And maybe some tacos!) Sending big love to you and B.
I can’t get enough of cauliflower lately and I love tacos so win win! Thanks for sharing. Made these tonight. Recipe came just in time. Had an abundance of cauliflower to try new recipes. These were amazing. So flavorful and a definite keeper. I’m always looking for Meatless Monday ideas. Thanks for sharing! Made this tonight. The spice on the cauliflower is great and I love all of the balance of flavors in the beans, crema, and cauliflower. I may have needed to go a little easy on the lime juice but I liked the tartness since I didn’t add extra salt to the beans. Thanks for this great recipe! Oh my god, this is hands down the best cauliflower I’ve ever had. 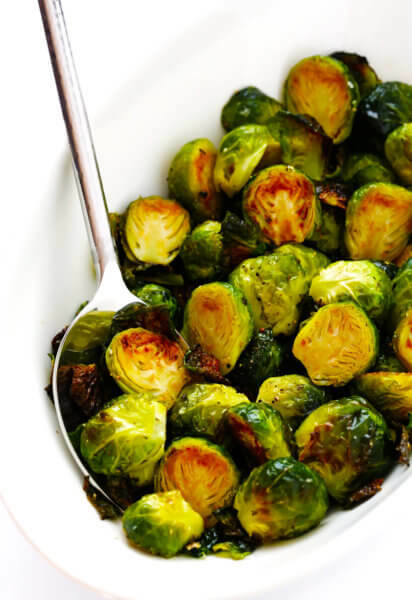 SO flavorful and delicious! (Actually, I can’t decide what’s better – the cauliflower itself or the minced garlic that gets all crunchy in the pan – YUM). Love the crema too, so many flavors I wouldn’t have thought to mix. I will be making this again soon, thank you! I think I can convince my family to eat plant-based for a night with a recipe like this! I love the beautiful color you get with the turmeric (not to mention the health boost)! That was excellent, just made it tonight, it was wonderful. Bonus: I made more of that delicious sauce, so can put it with chickpeas later this week, and have more refried beans so halfway to more tacos or burrito bowls. Thanks! I made these for dinner tonight! I subbed brown rice for the tortillas (I forgot to get them) and it was still DELICIOUS! Thanks for the recipe! I made this for my family and it was a hit! I couldn’t find tahini so I cheated and added some plain organic hummus that I had in the frig in the place of the tahini and it worked out just fine. 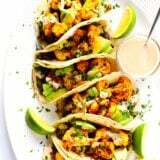 I also sautéed some shrimp in oil and seasoned it with chili powder and garlic to add on top of the tacos, for my family to try, and the flavors went well together. I wanted to make this but didn’t have some of the key ingredients. So I chopped up tomatoes, cucumber, and broccoli and tossed that in with the spices that would have been for the roasted cauliflower. I set that aside (and left it raw) and cooked up the beans but instead of black beans, I used white navy beans. I also didn’t have any tahini so I used softened cream cheese in place of that. (Which surprisingly turned out amazing). Then I got a low carb wrap and fried it on a skillet with olive oil. When I assembled my wrap I sliced some avocado and lemon and placed that on top. I am so pleased with how it turned out even with all of my substitutes. I encourage anyone who doesn’t have all of the ingrediants to mess around and see what you come up with. Mine turned out delicious. Absolutely fantastic recipe! Thanks for sharing. So flavorful and healthy. I can’t wait to make it again. It was a huge hit with the husband too! Sooooo fabulous!! Making it a second time tonight! I made this dish last night. Superb! 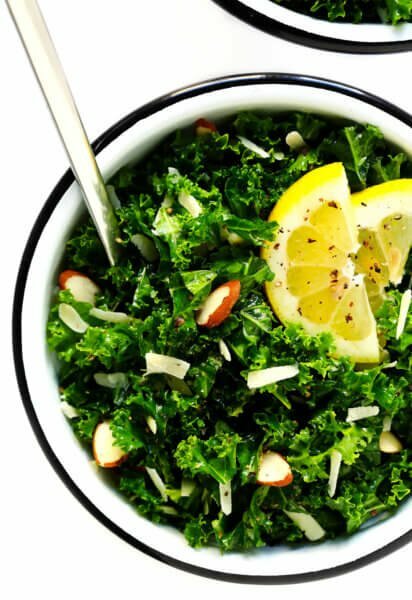 It is National Vegetarian Week here in the UK and your recipes came to me through a campaign by the Vegetarian Society which is running on Facebook. Your recipes are accessed through their website. My daughter is vegetarian so I am always looking for new ideas of dishes to cook. This one was a big hit. This does look very tasty, thanks for the Vegan foods. The roasted cauliflower was wonderful, nice spice balance without overpowering the delicate veggie flavour! This was a winner. I’ve been trying to nudge my family away from meat, but finding vegetarian recipes that my kids love has been a challenge. This recipe, however, has been a huge hit. 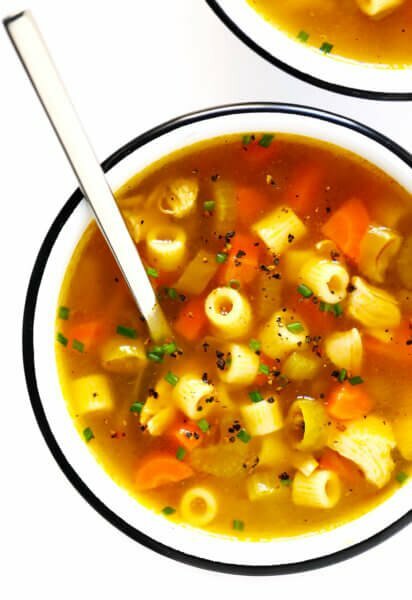 My daughter loves taking the leftovers – bowl style – to school for lunch. I just made these tonight for me and my husband and they were amazing!! We are trying to eat better and I was impressed with how good these turned out. I could eat the cauliflower by itself!